Last night, beloved and I ate at Sumo Sam. Beloved was craving for sashimi and sukiyaki last night, and our choice was this or another somewhat-newly opened restaurant called Kimpura. We decided to go here because the latter was a bit intimidating with most of their patrons wearing a formal attire. This newly-opened Japanese restaurant apparently specializes in “steak, seafood, and sushi”. We did manage to get a peek of their menu, and saw that their prices was way steeper than the usual Japanese resto. However, hoping quality and quantity was better, perhaps on par with that of Sakura, we went in. Their menu was heavy, literally and figuratively. Nothing’s cheap, but there’s a lot of stuff you don’t usually find in other Japanese restaurants. What caught my attention the most was the fact that they serve Wagyu beef. It doesn’t come cheap, though—around a thousand per hundred grams. The first and last time I ate Wagyu beef was in my childhood, but I still remember that heavenly sweet taste, and divine melt-in-your-mouth texture. Since I didn’t plan on going back here after seeing their menu in its entirety, I decided to order their Wagyu beef in burger form—Wagyu Burger (528 Php) whith three kinds of mushrooms and onion rings on the side. Beloved, as she was craving for sashimi and sukiyaki, ordered them, which happens to be in the menu. Their Sukiyaki was 369 Php and the Assorted Sashimi was priced 378 Php. We also ordered green and red iced tea for ourselves (98 Php each). After the drinks, the sashimi came first. 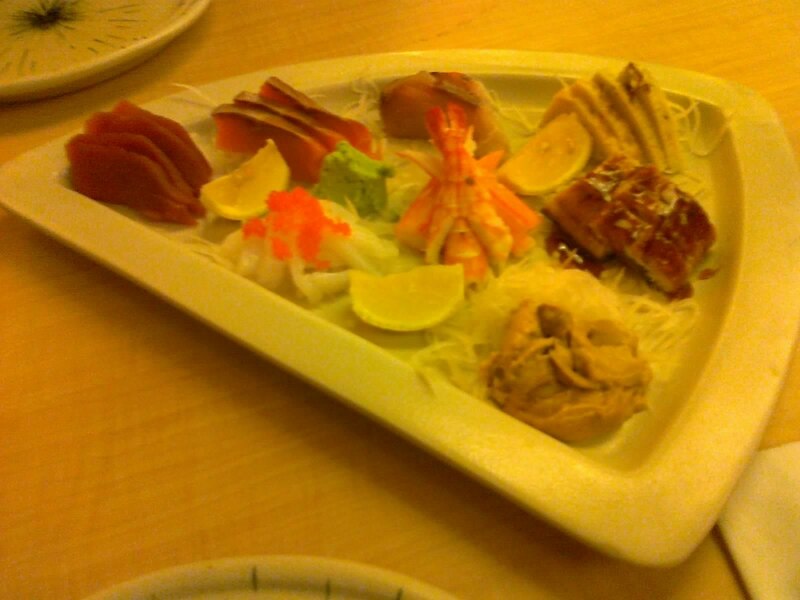 The plate had tuna, salmon, hamachi, squid, shrimp, crabsticks, tamago, barbecued eel, and uni. The slices were very disappointing in size and quantity. The quality was dismal for its price as well. The raw fish was forgettable, and the only item that really caught our attention was the eel. The sukiyaki came next, and it was a generous bowl. On the hot pot were tofu, beef, assorted vegetables, and noodles. They also had a single egg for you to put in. Taste-and-quantity-wise, it was satisfactory. The soup was sweet as sukiyaki should be, but wasn’t really overpowering—just right. The beef was pretty tender, and the tofu was delicious. Finally, my burger came. It was a pretty big burger, but not as big as those I can get for a third of the amount it costs, considering the beef wasn’t of divine quality. But did the beef reach my expectations? The taste was there, but the melt-in-your-mouth texture that I so long have been craving for was not. Yes, it was sweeter than your usual beef, and it had all the juices intact, but it felt like a not-so-special burger. The mushrooms didn’t really do anything. 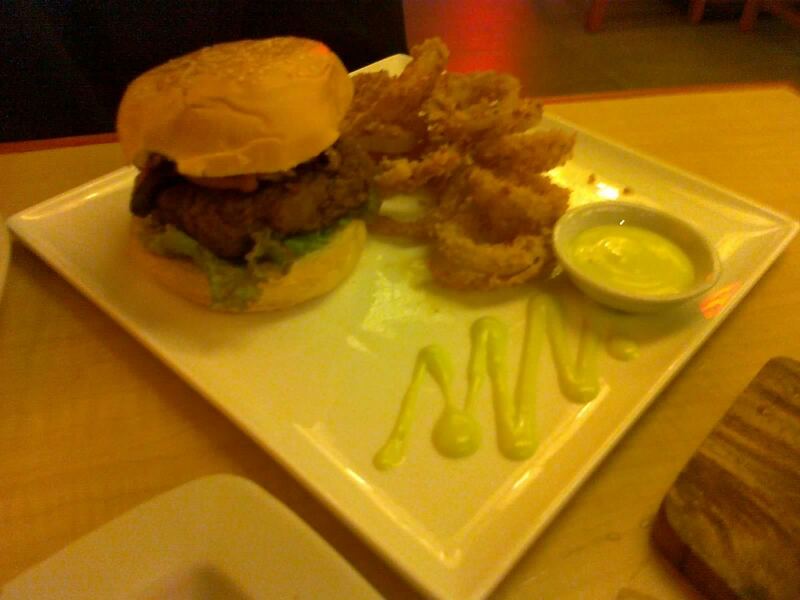 And while the onion rings was pretty good, especially with the wasabi-mayo dip, it really wasn’t what I paid so much for. Disappointing? Very much so. Maybe it was because I ordered it medium rare when it’s supposed to be rare or raw, or maybe because it was ground beforehand, or maybe because it wasn’t really authentic Japanese wagyu. I’d rather not spend time and effort finding out. 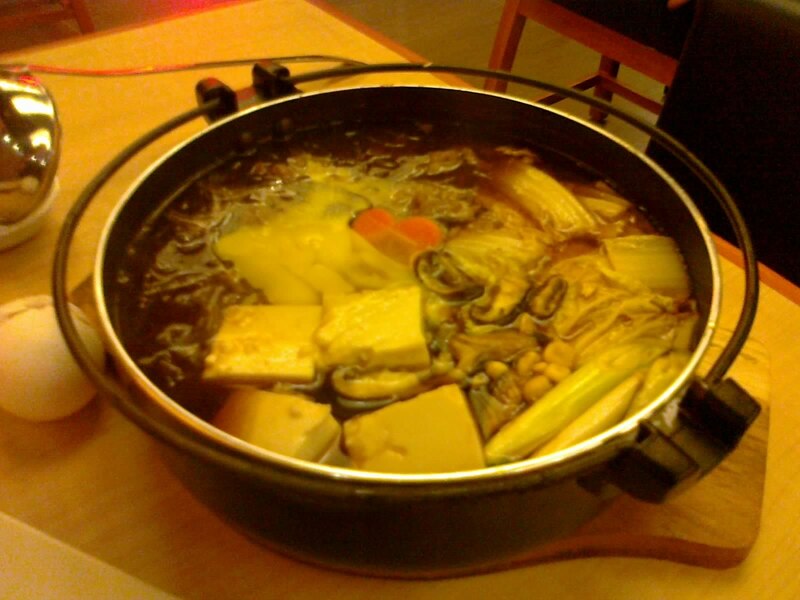 Overall, the only item we really enjoyed was the sukiyaki, and we didn’t even get to finish it. Our bill amounted to 1.6K, that’s 800 for each head, because of the service charge. It’s going to be a very long time before I go back here again, and I’m pretty sure the next time, if there is a next time, the bill won’t be paid by money from my pocket. Recommended for: Very rich patrons. Not recommended for: Impoverished people. Smart nomnomnom tip: Come in a party of four—they have set items good for four which is probably the only thing that’s decently priced.